However, I worry that the coat, woven of 30/2 cashmere/silk and a metallic gold yarn, will be too hot and heavy, especially if lined.Â However, changing the yarns to 60/2 silk (which is half the weight of 30/2 silk, making the fabric much thinner) would reduce the pattern to near invisibility.Â Also, my metallic was the weight of 30/2 silk, not 60/2, so it wouldn’t produce a balanced weave. But then I remembered that Bonnie Inouye had told me about her article in Complex Weavers about turning Summer and Winter to make a one-shuttle weave.Â Somehow she also managed it so that you don’t need two warp beams, either, which was intriguing, so I dug out the article.Â Sharon Alderman was kind enough to convert the eternity-knot draft to Summer and Winter for me, so I am working my way through that draft (trying to understand it) and then figure out how to turn the draft using Bonnie Inouye’s method.Â I’m also reading through Lillian Whipple’s article in WeaveZine on designing Summer & Winter, hoping that between the three of them I’ll be able to work it out.Â I’ve never woven a tied weave before, so designing one is a real stab in the dark.Â But I think that with patience and some help from more experienced weavers, I’ll be able to work it out.Â I’ve started working on it in the early mornings, before Mike is awake, when I can’t weave (without waking him, anyway).Â Hopefully I’ll have something tomorrow afternoon. I have also received from Japan a real novelty: a fine gold thread made with real gold!Â I don’t quite have enough for a full 15 yards of anything, but I ordered a little more from Japan and hopefully that will make enough to weave something.Â So if this Summer and Winter idea doesn’t work, I now have a fine gold thread to match the 60/2 silk.Â I think I will try weaving up a small sample at 72 epi, on the remnants of the warp I’m currently working on,Â just to see how it looks.Â The thread is beautiful, and I like the idea of having real gold in the garment.Â Perhaps the smaller scale will work – you never know. Oh yes.Â The new job?Â Absolutely perfect.Â It’s exactly what I wanted – there are definitely problems, but they are all very approachable.Â I dove straight in and have already worked out with my boss the strategy for the first 2-3 weeks.Â I like everyone, the problems are interesting, and it’s great fun.Â I’m really enjoying it, which is a blessing. Remember that you can use a double two-tie threading or a summer and winter threading. The first begins: 1-3-2-4-1-5-2-6. Every other warp is on the first two shafts and the rest must alternate odd/even pattern shafts. Summer and winter threading starts 1-3-2-3, 1-4-2-4, 1-5-2-5. 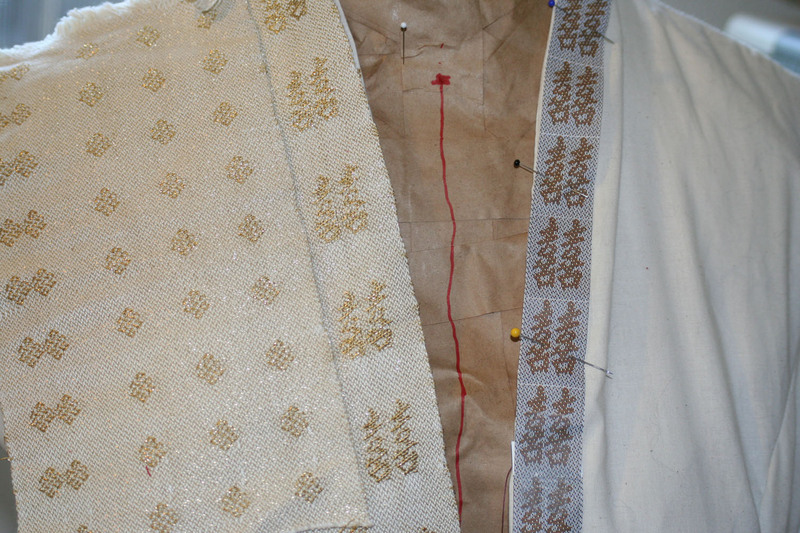 It gives a larger scale and needs a longer treadling, and gives a slightly different look to the background. I wrote two articles for CW Journal on this topic and also one for Handwoven. There are many variations that will work, but I prefer the method in these articles. I have a warp on the CO loom for turned summer and winter and a draft with the kanji for Ino and Ue (Uye). Bonnie Inouye.